This project will be supported by „Europäischen Fonds für regionale Entwicklung (EFRE)“ and „Gemeinschaftsaufgabe „Verbesserung des regionalen Wirtschaftsstruktur (GRW)“. 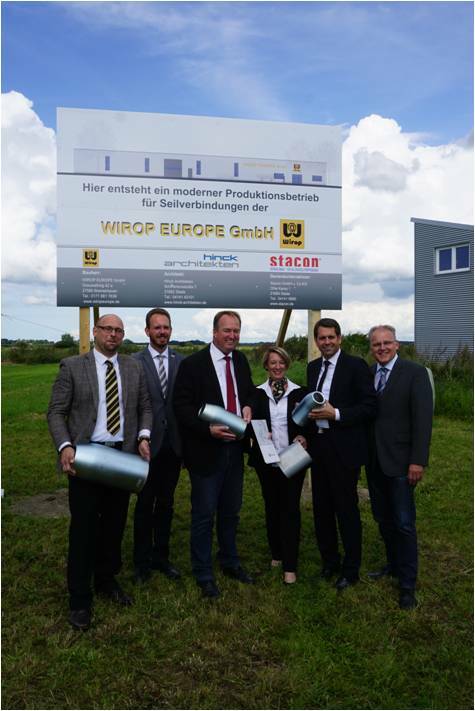 The support approval for the new building of Wirop Europe GmbH was handed over by the Lower Saxony Ministry of Economic Affairs. A milestone for the construction of the new production facility in Germany. 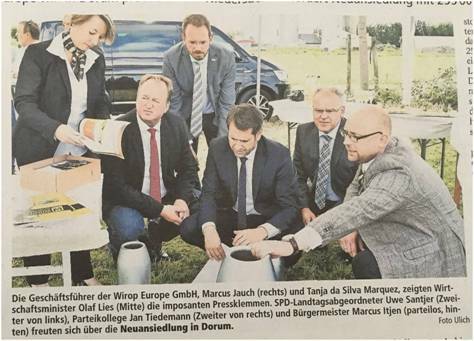 The General Managers of Wirop Europe GmbH, Marcus Jauch (right side) and Tanja da Silva Marquez, are showing the Minister of Economy Olaf Lies (center) the enormous ferrules. The Social Democratic Party of Germany (SPD)-Member of Parliament Uwe Santjer (second from left side), party colleague Jan Tiedemann (second from right side) and mayor Marcus Itjen (non-party, behind) were glad about the new settlement in Dorum. Here is being built a modern factory for rope connections of Wirop Europe GmbH.